Milan or Milano as it is called in Italian is financial city of Italy. It is the second largest in Italy after Rome. Milan as it is a modern city does not have any historical sites as such but it is well known for the lifestyle of enjoying worldly pleasures: Milan is a paradise for shopping, opera, and nightlife. Milan remains the capital for Italian fashion fashion aficionados, supermodels and international paparazzi descend upon the city twice a year for its spring and autumn fairs. Central railway station The main railway station is the Central Station ('Milano Centrale'), which is served by Trenitalia, the State Railways. 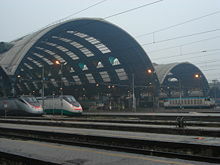 Regular express and fast trains serve all Italian cities (Turin, Venice, Rome, Naples, Florence and many others), and some European cities (Barcelona, Zurich, Geneva, Munich, Paris, Stuttgart, Zagreb, Vienna, etc.). The station building is in itself worth a visit being a masterpiece of rationalist architecture. Note that the station area is not in a great part of town at night, though in the area there are a number of decent budget hotels (see "Sleep" below) and some business-oriented international brand hotels. In general the area south of the station (characterized by a few skyscrapers) is a business and local government center, pretty active during working hours but almost deserted at night. Should you need a few supplies for your trip, there is a small supermarket in the western side of the station at ground level, as well as cafes and other small shops. Internet points in the main square overlooking the station. In 2008 the station is completing extensive renovation. At night, parts of the Central Station become a sleeping area for vagrants. Usually around the station there are some foreign gypsy children aggressively targeting tourist for pickpocketing, so pay attention to your bag. The Central Station is served by MM2 and MM3 metro lines and is a masterpiece of Rationalist architecture worth a visit. Taxis stops directly in front of the station (on the sides during the renovation period), and ATM buses on the West side (IV November Square) and buses to Linate, Malpensa and Orio airports on the East side (Luigi di Savoia square). Garibaldi station is the terminus for most commuter railway lines and is served by the state railways. It is also a stop for the MM2 metro and for the Passante suburban commuter train link (see #Get_around). Other main train stations are Lambrate (connected to MM2 metro line), Greco-Pirelli, Rogoredo (connected to MM3 metro line) and Porta Genova (connected to MM2 metro line) for the FS Trenitalia railways and Bovisa (connected to the Passante suburban commuter train link) and Domodossola for the Ferrovie Nord railways. Domodossola station is very close to the city section of the Milan Exhibition Centre - fieramilanocity, also connected to the subway system by the MM1 metro line. Note that Ferrovie Nord (FNM) and Trenitalia (FS) are two different railway networks, with different stations, different trains and different tickets. For example, if you need to go to Malpensa airport and you are in FS Greco Pirelli, you need to go first to Garibaldi train station, then take the MM2 metro to Cadorna train station and then the Malpensa Shuttle train to the airport. In some cases from Garibaldi station, you can take the Passante suburban commuter train link to Bovisa FNM station (these trains leave from the underground station below Garibaldi station and next to the MM2 underground station. Be sure that the train you take stops at Bovisa). From Bovisa you can get on the Malpensa shuttle train. A1, the Autostrada del Sole (Highway of the Sun), a six-lane motorway linking Milan to Bologna, Florence, Rome and Naples. A4 Westbound, a six-lane motorway linking Milan to Turin, the Westyern Alps and France. A4 Eastbound, the Autostrada Serenissima, an eight-lane motorway linking Milan to Bergamo, Brescia, Verona, Padua and Venice, and further to Trieste and Slovenia. A7, a four-lane motorway linking Milan to Genoa, the Ligurian Riviera and the Cinque terre. A8, the Autostrada dei Laghi (Highway of the Lakes), an eight-lane motorway linking Milan to Lake Como, Lake Maggiore, Lugano and the rest of Switzerland. A9, a four-lane motorway linking Milan to Varese and Western Ticino in Switzerland. A50, A51 and A52, respectively the West, East and North Ringroads (Tangenziale Ovest, Tangenziale Est, and Tangenziale Nord) connect the various motorways forming a six-lane ringroad around Milan. A53, a four-lane motorway linking Milan to Pavia. The main highway operating company is Societ� Autostrade per l'Italia. Because of heavy traffic, it is strongly recommended not to drive in Milan during working days. Driving is much better during weekends. A recommendation is to leave your car in one of the well-marked, huge commuter car parks near several exits of Milan's motorway ringroad; they're managed by ATM and are easily connected with Milan's underground metro lines, but they close around midnight. They're near highway exits in Cascina Gobba (East), Lampugnano (North West), Molino Dorino (North West), Bonola (North West), Rho-Pero (North West), Bisceglie (South West) and San Donato (South East). If you must drive in Milan during weekdays, then make sure you have an up-to-date map showing the one-way system. Traffic congestion fee - Since January 1 2008, cars entering Milan's central area within the former walls of the city (cerchia dei navigli) must pay a fee (�2,�3, �5 or �10 depending on the engine and age of the car): there are cameras in all entrances to this area and all registration plates are recorded. Payment can be made by purchasing entrance cards at newspaper stands, online or by sms (call 020202 for information). Failure to pay within 48 hours from entering the area implies a fine of �36. FS Garibaldi Train Station is also Milan's main Bus terminal. The main national bus lines are operated by Autostradale, but there are many other small companies offering even international travel. 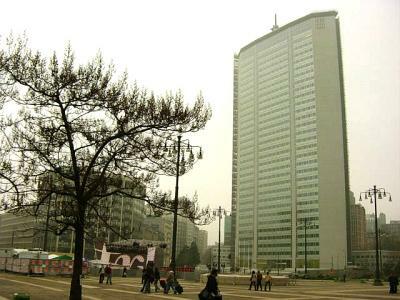 Milan�s efficient public transport system is run by ATM (800 808 181; www.atm-mi.it). The metro consists of four underground lines (red MM1, green MM2, yellow MM3 and blue Passante Ferroviario), which run from 6am to midnight. A ticket costs �1 and is valid for one ride or up to 75 minutes� travel on ATM buses and trams. You can buy a book of 10 tickets (five double-journey tickets) for �9.20 or unlimited one-/two-day tickets for bus, tram and metro for �3/5.50. 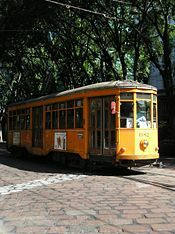 Tickets are sold at metro stations, tobacconists and newspaper stands around town, but you can�t buy them on board. Free public transport maps are available from the ATM Info Point (7.45am-8.15pm Mon-Sat) in the Duomo metro station. Street parking costs �1.50 per hour in the city centre (�2 per five hours after 8pm). To pay, buy a SostaMilano card from a tobacconist, scratch off the date and hour, and display it on your dashboard. Underground car parks charge �5 for the first two hours and between �1.50 to �2 per hour after that. Rental car companies have offices at Stazione Centrale and both airports.